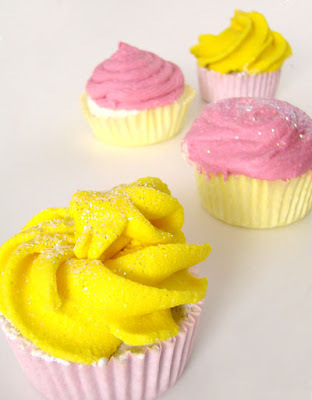 Bath Bomb Cupcakes – New Recipe Tomorrow! I am soooooo excited. We’ve figured out a new recipe for Bath Bomb Cupcakes with a frosting that more easily melts and fizzes in the tub. Though I am traveling to Arizona in the morning to learn from the great Jim Collins about how to build a company with lasting significance and legacy, there will be time tomorrow (at some point, in between airports or hotels) to post this exciting and new recipe. It’s the next evolution of our original fun recipe and I can’t wait to share it with you. Previous Post: New Brushes and Soap Boxes. Oh Boy! Uh oh! What two links are you clicking on? I just checked them all and they worked for me. Weird. Just let me know so we can get that fixed. Oh!! Wow!! Cupcakes are kids favorite food!! Thanks for the link!! Nice detail for making cupcakes!! Kat, That’s saying something if even the men like the Bath Bomb cupcakes! = ) Just wait until they try the new goodies. MichelRu, I have had Katie’s and also was underwhelmed. That said, if I were to pick one to get, it would be their Banana Creme one. It was delish! I also wish their cupcakes were a little larger and not “normal” sized but eh, I’m picky. And, me, I’m a Cupcake Royale gal – not a Trophy gal – though I do love the Trophy merchandising but Cupcake Royale had me with their Red Velvet and now Chocolate Salted Caramel. It is better than anything I’ve ever had in my entire life …. Speaking of cupcakes… B’ham has an actual cupcake shop now. Not sure if you had heard or not. Very exciting. I look forward to it. I have not made bath bomb cupcakes in quite some time. Will be fun to play again and do so.